iPhone 8, 8 Plus, X, 7, 7 Plus, 6, 6s, 6 Plus & More! Custom iPhone X, XS, iPhone 8, iPhone 8 Plus, iPhone 7, iPhone 7 Plus, iPhone 6, iPhone 6s, iPhone SE, iPhone 6 Plus, iPhone 6s Plus, iPhone 5c, iPhone 5, iPhone 5s, iPhone 4s & iPhone 4 Cases & Samsung Galaxy S8, Galaxy S7, Galaxy S6, Galaxy S5, Galaxy S4 & Galaxy S3 Cases. MADE IN THE USA. Welcome to Design Mavens NYC! We create fun, whimsical & quirky phone cases for the iPhone 8, iPhone 8 Plus, iPhone 7, iPhone 7 Plus, iPhone 6, iPhone 6s, iPhone SE, iPhone 6 Plus, iPhone 6s Plus, iPhone 5c, iPhone 5, iPhone 5s, iPhone 4s & iPhone 4 Cases. As well as the Samsung Galaxy S3, Galaxy S4, Galaxy S5, Galaxy S6. All items in the store are handcrafted by me in my home based design studio. We also offer unique custom cases. New designs are added daily- so be sure to stay tuned! Love it! Great quality & seamless transaction. Will be back for more! Gorgeous and getting so many compliments! Amazing customer service and lovely packaging. Thank you! Stunning! I have been ordering personalized ornaments from this shop for the last several years. Always a huge hit- Highly recommend! Beautiful! My go to shop for all of my phone cases. Thank you for all of your help! Because being Happy is Always in Style. Hola, Bonjour, Ni Hao, Hi there! My name is Karen and I am the creative director & founder of Design Mavens NYC. I am a true believer that life should be lived colorfully and that being happy is always in style. Design Mavens NYC was launched in 2012 after I could not find a fun and cheery phone case that was trend right, affordable, and able to handle every day wear and tear. Having spent over sixteen years as the design director and head designer for some of the most loved and well known apparel and accessories brands both in the United States and Europe; I tend to see every phone case & mobile accessory as a fashion accessory that can be switched out depending on your mood, an outfit or an event. Your phone case is more than just a case it is a statement. I am a one woman show. All cases are designed, printed & assembled by me in my home based design studio here in the USA. I use an advanced heat transfer process to hand print each and every case & accessory. Inspiration is drawn from many sources including nature, travel, music, pop culture & vintage textiles. Color plays a big part in the Design Mavens NYC philosophy. It is the driving force behind every design & is why I believe every day should be lived colorfully. Eclectic mixes of vintage & retro inspired print and pattern can be found throughout the collection. Quirkiness is my middle name. I love playing with pattern and color. Design Mavens NYC has received national recognition in both Glamour and People magazine, Refinery29 and Zulily; as well as other numerous blogs and publications. Welcome, Hola, Bonjour , ...... to Design Mavens NYC! We are 100% committed to our customers satisfaction. We believe that everyone has a very unique & personal style & that life should be lived colorfully! 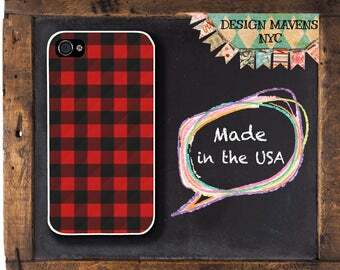 Our iPhone cases are produced by using an advanced heat transfer process. The images will not fade and will resist scratches. *If for any reason you are not happy with your item, please return the item back to us within 14 days of receipt and we will refund or exchange it. Original item must be returned & buyer is responsible for return shipping fee. Please note that the buyer will not be refunded for shipping costs. *We accept direct check out with Major Credit Cards & PayPal thorugh Etsy. *Products are processed & shipped during the holiday season within 15-20 business days after payment has been received. *If you are an "International or Canadian" buyer please note that you must supply your telephone number for shipping purposes only before your order can ship. *If you have any questions regarding the check out process please feel free to contact me, so that I may assist you. *Orders will be cancelled if payment has not been received within 7 days of placing an order. **** PLEASE READ: CURRENTLY DUE TO THE HOLIDAY RUSH- All orders are processed & shipped within "20-25 BUSINESS DAYS" from receipt of payment. *Reminder- Please be sure that your correct shipping address is listed at checkout and on your Etsy receipt. Orders in the United States are shipped via USPS First Class Mail. A confirmation email will be sent when your item has been shipped. Domestic orders typically take 2-5 days to arrive. Delivery tracking is available. International orders are shipped via USPS First Class Mail. A confirmation email will be sent when your item has been shipped. Please note that orders shipped outside of the U.S.A are subject to regular customs & duties fees. The buyer is responsible for their payment should they occur. International orders typically take 2-5 weeks to arrive depending on the destination. Delivery tracking is available. Insured shipping is available for an additional cost. ***IMPORTANT****INTERNATIONAL & CANADIAN BUYERS ONLY- At checkout please advise your telephone number for shipping purposes only. The United States Postal Service requires that all international shipments originating in the USA contain the telephone number of the recipient. Your purchase can not ship until you supply your telephone number. ***IMPORTANT- BRAZIL CUSTOMERS**- Unfortunately, due to much loss and mail theft I am no longer shipping to Brazil. If you place an order & you are in Brazil I will cancel your order & issue you a refund immediately. Thank you for your understanding. Design Mavens NYC would love to do a custom order for you! Please feel free to convo me & a listing will be created for you. You will be sent 2 proofs before the final image is printed.